I AM A SURVIVOR, ADVOCATE, FIGHTER, WARRIOR....Many of us have lived through things we would never have thought we were capable of, and we are much less afraid than we used to be. The process of wounding awakens us to our strength. It shuffles our values, and the top priority is never what you thought it would be. It’s never about perfection, or power. It always turns out to be about love. Knowing ourselves to be vulnerable and our time here to be limited, we’re freed to live more passionately, and fully than we have before, to discover what’s worth fighting for and who we are. Real strength is buried at the depths of any wounds we have survived. You Are Stronger than any of your circumstances or situations! Believe it! Never forget WE are Warriors and Fighters...Never Give Up! We are the someone's who has the courage to step forward and bring light to a dark life treating subject. We are individuals whose lives were changed forever by the 3 words, "you have Sarcoidosis". We are survivors and caregivers who are dedicated to the fight against all forms of Sarcoidosis. Through our own experiences, we are aware of the trauma and life-altering changes this disease can cause — and we are here to help. Together we are better for we all need one anothers Strength, Words, Prayer, Love and Support to make it through each day. For most of us everyday is a struggle to just do ordinary things but we refuse to give up because we are Warriors and our toughness is in the soul and spirit, not in our bodies and muscles. We are each others teachers...learning from one another what others may not understand as we bring Sarcoidosis to the for front to give it the recognition it deserves, too wake people up and give them some understanding just how much Sarcoidosis can affect, change and destroy a persons life. There needs to be a focus on improving the quality of life for patients, survivors and their families and on accelerating the discovery of understanding where this disease comes from, new treatments and cures for this debilitating and often fatal disease. The most important thing in illness is never to lose heart. Feed your faith and your fears will starve to death. We each gain strength, courage and confidence by every experience in which we really stop to look our fear in the face. For Attitude is a little thing that can make a big difference as the human spirit is stronger than anything that can happen to it. No matter your situation or circumstance never, never, never give up. Do not be afraid of tomorrow; for God is already there for once we as Warriors choose Hope, anything's possible. Hope is that thing with feathers that perches in the soul and sings the tune without the words and never stops... at all. Wherever you go, no matter what the weather, your condition and pain, always bring your own sunshine. Enjoy the little things, for one day you may look back and realize they were the big things. We are Warriors... Hear Us Roar! We do not define ourselves by how many roadblocks have appeared in our path. We define ourselves by the courage Iwe have found to forge new roads. We do not define ourselves by how many disappointments we have faced. We define ourselves by the forgiveness and the faith we have found to begin again. We do not define ourselves by how long a relationship lasted. We define ourselves by how much we have loved, and been willing to love again. We do not defineourselves by how many times we have been knocked down. We define ourselves by how many times we have struggled to our feet. 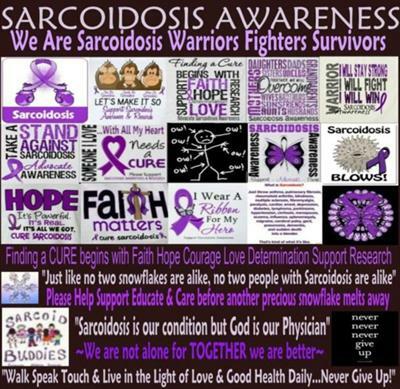 We are not our pain of Sarcoidosis. We are that which has Surivives the Storm, Emerged from the Fire.